I am departing Shanghai once again. This is my second time visiting this great city, but this time with 3 months of travelling in between analyzing Asian cities. I will be leaving with a different knowledge of Shanghai than with my first departure– my first exeperience in Shanghai gave me a familiarity, while this one allowed me to appreciate the “real” Shanghai beyond the cliche and realize the beauty of the everyday. Making an impromptu decision to visit Hangzhou, I decided to take the high speed CRH Chinese High Speed Rail. Just recently, CRH set the world record speed of high speed rail trains and I wanted to compare this experience to the Shinaksen in Japan. Once I arrived at the platform looking at the aerodynamic nose of the CRH train, I was overcome with the same excitement that I had months ago in Japan riding the Shinkansen. Though my emotions were the same, the reasons why I had this amazement was completely different. I was in the People’s Republic of China, a country that has just come out of the Cultural Revolution only 30 years ago. After a decade of isolation, China has the technology that matches and even exceeds that of Japan, which has developed with constant progress. Perhaps in Japan, my amazement came from this first sight of the great and majestic Shinkansen. Japan was the first country to effecitvely utilize high speed rail by alleviating the congested and overloaded roads and rail lines between Osaka and Tokyo. Now, the Shinkansen connects cities like Osaka, Tokyo, Sendai, Yokohama, Hiroshima, and Fukuoka. As the bullet train arrived in Tokyo station for a few short minutes, I saw its long, aerodynamically shaped nose that reminded me of a duck or platypus. When the train reached this as its termius, I wanted to ride the train right away as the passengers got off. However, I had to wait because the workers were preparing the train to head the other way. I was easily amused by the automatic turning of the chairs as the train prepared itself for the new wave of passengers heading towards another destination. I loved watching window washers meticulously cleaning to keep the prisitine apperance of the train. When I was finally allowed in, I waited for the food cart lady to come by, not because of the snacks on it, but to see her bow before she exited each car. Everyone had their belongings neatly stacked on the overhead storage area or in the back of the cabin. A man would eventually walk by to check our tickets recording it in his book, and sometimes stamping it with a purple insignia that was handed back to me with two hands and a quick bow. That was in Japan, and now I am in China. I arrive in a large atrium space after purchasing my ticket to ride the bullet train to Hangzhou. I blinked my eyes like I was in a dream because I was in disbelief that that China is capable of having this major transportation hub and have high speed rail connceting major cities right underneath after a period of global isolation. However, I was upset because I couldn’t see the arrival and preparation ritual of the train for its next journey like in Japan. I didn’t even know if there was one given the fact that China neglects the maintenence of things. As I reached the platform, everyone quickly rushed to their cars, while I deliberately walked to the end of the train to see the nose of the bullet train. Not quite as cool looking as Japan, but it can still hold its own in speed. The workers looked at me funny because my peers and I were the only ones who were taking pictures in the chill, while everyone was already comfy and cozy in the train. Once inside, there were many migrant workers who stuffed many of their belongings unorganized on top of the bars. People were eating and constantly talking especially if they had companions sitting next to them. There were also sliding doors that people never closed because it became and inconvenience for both the stewardness and the people walking to the bathroom. I was anticipating a cart lady to come by, but instead I was sent the food zone that all passengers could visit. There was no man to check my ticket because the turnstile had registered it. The service aspect was completely removed and everyone was in their own self contained bubble within the confines of their seats. I dare not to say that I did not have a journey to Hangzhou, but rather it made me reflect on my rides on the Shinkansen. Within the contained vessel of the bullet train cabin, I was able to get two different experiences. It was the Japanese perfection of the job at hand versus the loud talking, spitting [not on the floor thankfully], and space hogging people. Even looking at the city morphology pass by when travelling from the city center to the outskirts back to the city center, I noticed the differences with Shanghai and Japan’s urban condition. Because of the limited amount of land in Japan, most of the density is centered within the city and as you move toward the outsikts, there are few dispersed patches of civilization. Shanghai’s sprawl was apparent from the cabin as I saw a continuous fabric of clustered developments that eventually transitioned into fields of farmland. Riding in the high speed rail in two different countries made this trip come full circle in multiple scales. Zoomed in, I can make observations of the collective. By zooming out just a little bit, I can see the urban strategies of sprawl and densification. Zooming out and looking at Japan and China, I can conclude that each country is at different levels of development. 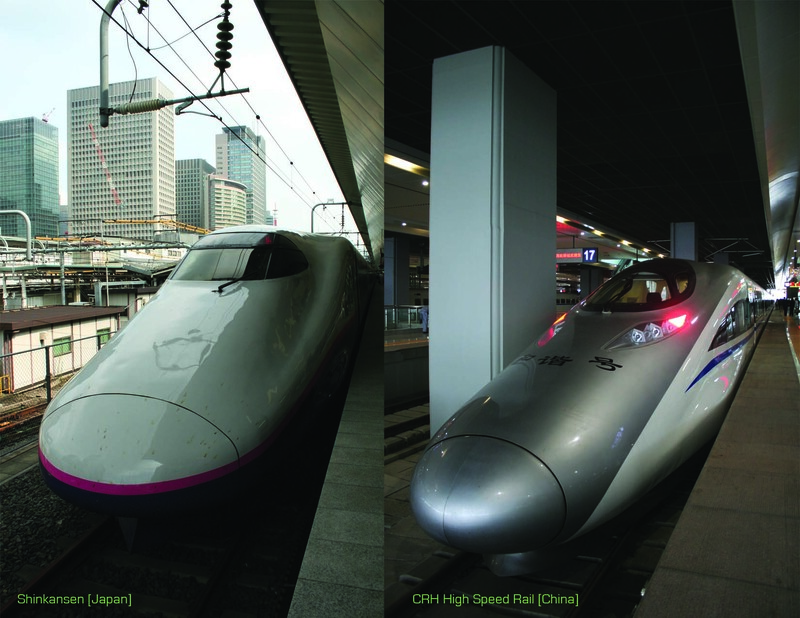 While Japan is connecting the already extablished and propogating cities, China is using high speed rail to link cities that are still growing. This fascination and excitement for both China and Japan have variations sets of factors giving each other the tension and an opportunity for me to spot these differences.